In fact I've been using them for a few weeks now. I was one of a few bloggers who was asked to try this range our before it hits Irish stores, and what I will say is they better stock up because I can see this flying off the shelves. They're aimed at high-end luxury with bargain prices. I was sent the colour protect range to look after my ombre-d and highlighted hair. They smell fantastic and feel really luxurious. 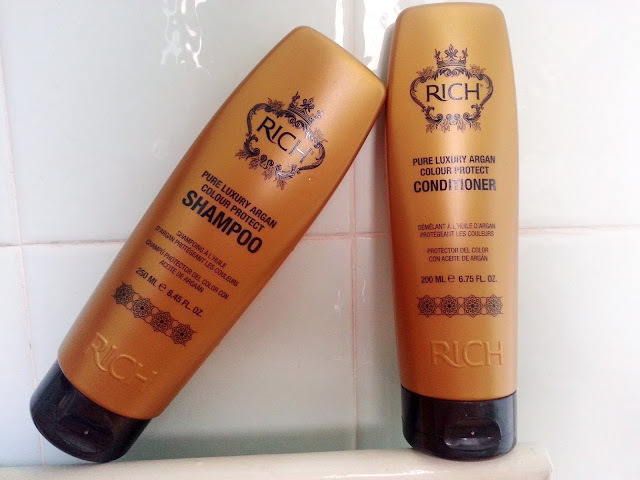 The shampoo is a little too thick for my liking, not what I'm used to from high-end products, but it lathers well one you have a good amount in and rinses clean. No buildup and not greasy at all. The conditioner is a dream - definite re-purchase material. My hair is instantly detangled, and stays light and soft for days afterwards. I had my hair highlighted 3 months ago now and it's still bright and shiny and the ends are in great condition considering I've been bold and used the GHD a few times recently.